By 1934 Harry T. Berger has taken over the company after having been the Vice President of the Nehi Bottling Company of Johnson City since its incorporation in 1931. (1) The company moves to 509 Sycamore Street by 1936. (1) According to the incorporation records the corporation's charter was revoked on July 21, 1939, no reason is given, what happens next might give us a clue. (4) On November 2, 1942 the Nehi Corporation of Johnson City sells all of their equipment at both Johnson City Tennessee and Bristol, VA to the Royal Crown Bottling Company of Knoxville, Tennessee for the sum of one dollar. (3) This suggests a possible connection between the two corporations. I would appear that the stresses of World War II sugar rationing, and its effect on the bottling industry, were too much for the company as it was for many of the same. 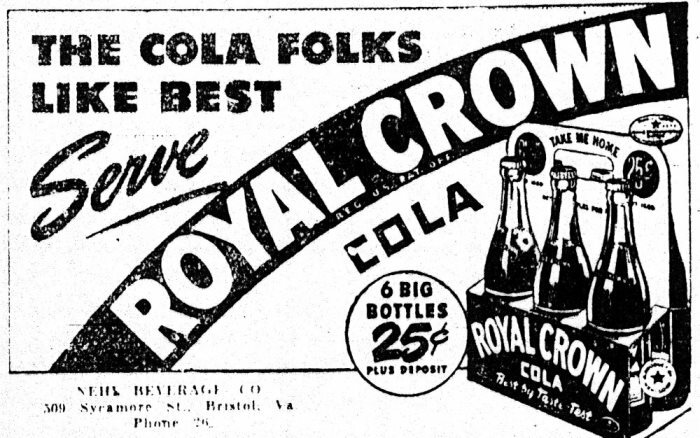 On February 21, 1944 the Royal Crown Bottling Company of East Tennessee was incorporated with J. M. Walker, associated with Royal Crown Bottling of Knoxville, Calvin Holmes, and S. F. Fowler listed. (3) The same year the company opens a new location at 72 Commonwealth Avenue. 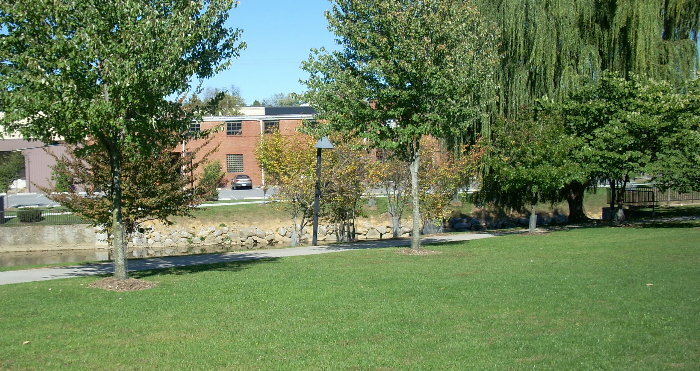 Lee D. Brown is listed as Manager of the Bristol location; however, he will become Vice President of the whole corporation by the end of the 1940's, and President by 1954. (3) Bass K. Gilley is Manager of the Bristol operation by 1946, and is listed as Superintendent of the company by 1948. (1) The last Manager listed for the company is Coy T. Holmes who is listed in 1951. 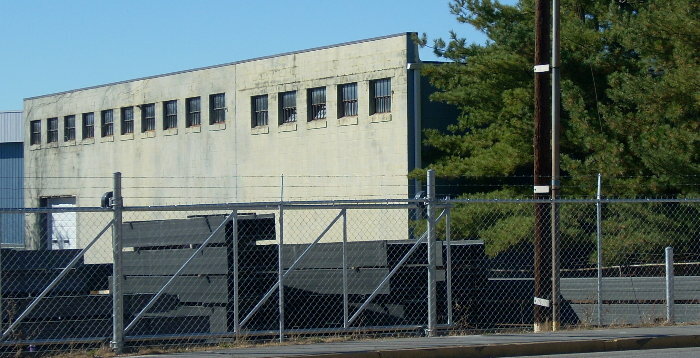 (1) It appears that the company moved from the Commonwealth Avenue location to 4652 Lee Highway, Bristol, VA after 1953, but I doubt they are bottling any longer most likely having become a warehouse for Royal Crown of Johnson City. The odd thing about the Bristol location is that there doesn't seem to be too many bottles from there. 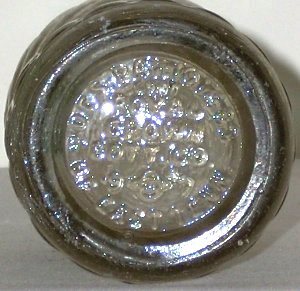 There are some Royal Crown Bottling Company of East Tennessee bottles with Johnson City noted on the back, and others that just have the corporation name with no town, it is possible that they were ordering the Johnson City labeled bottles at the Johnson City location, and possibly the no town name bottles were being purchased by Bristol. It is also possible that the no town name versions were a standard bottle that could be used as both bottlers with no issue. 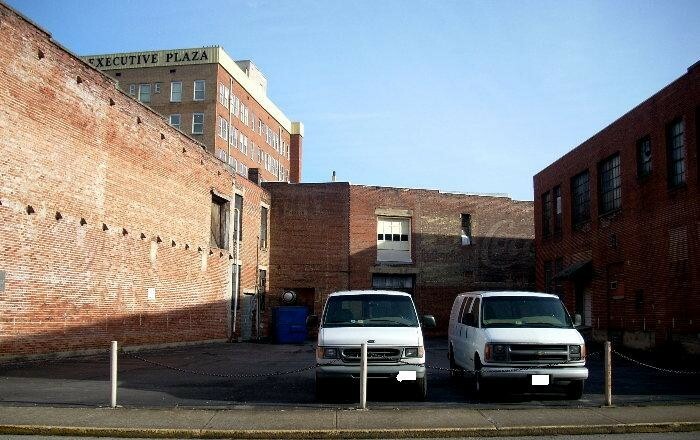 By my best estimation the gray car is sitting on the former spot where Nehi Bottling Company of Johnson City's warehouse once stood. Unfortunately the location on Moore Street no longer stands. This portion of Sycamore once housed Twin City Chero-Cola bottling company, Dixie bottling works, and Nehi Bottling Company, has been turned into a park. 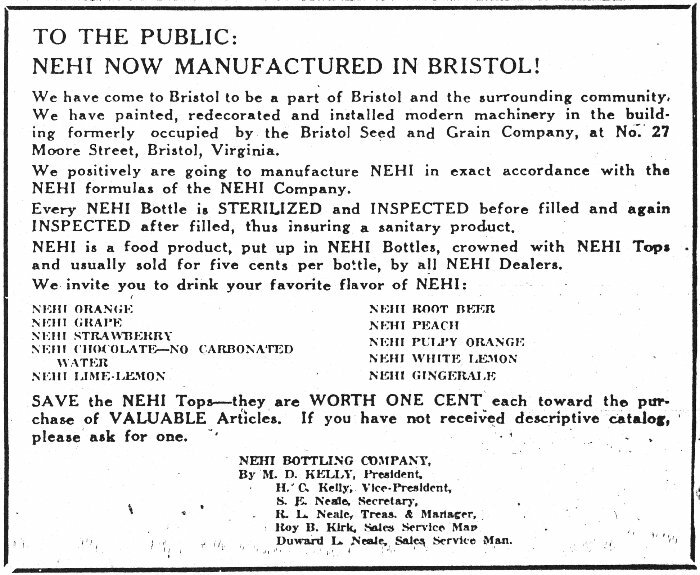 The ad announcing the start of Nehi Bottling Company in Bristol. 12oz Royal Crown Cola from 1942. 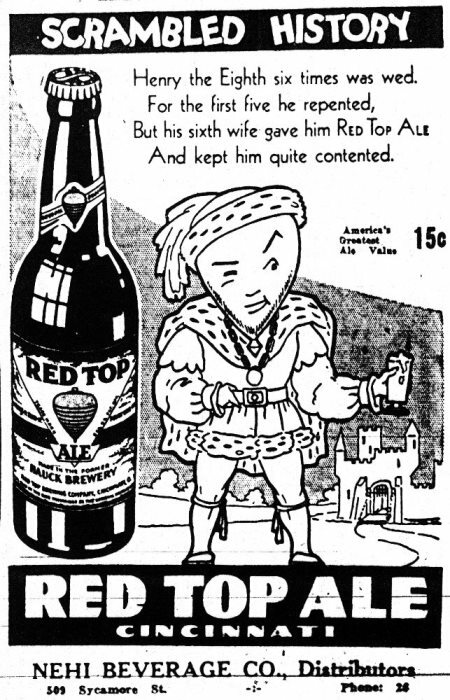 A July 14, 1937 ad for Red Top Ale, manufactured in Cincinnati Ohio, which Nehi Beverage Company distributed for many years. 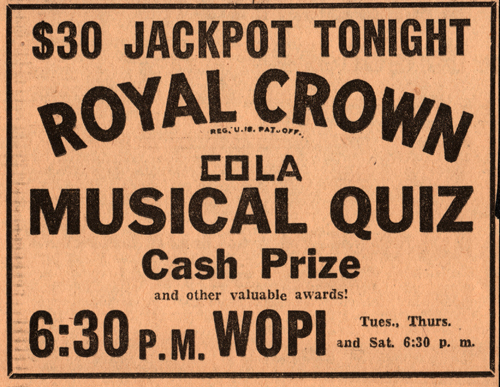 1945 ad announcing the Royal Crown Cola Musical Quiz which was broadcast on Bristol’s own WOPI radio. 10oz red & white label Nehi Bottle dated 1957. Looks like 1957 was the transition year from Red and Yellow labels to Red and White labels.